Today the Government of Sierra Leone and its partners launched a new five-year Strategy for Human Resources for Health (2017-2021). By guiding investments in the health workforce, the Strategy will support the country to improve the quality of health services and ensure it is better placed to respond to current and emerging health needs. 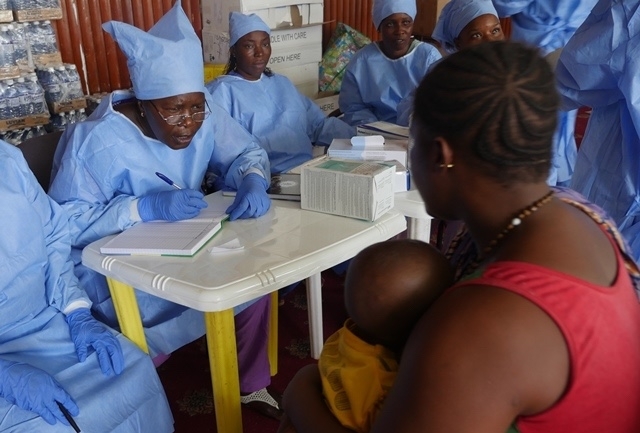 While there has been progress in training and building up its health workforce, Sierra Leone continues to face shortages of well-trained personnel, especially at middle-level clinical tiers such as midwives and specialist nurses. For example, there are only some 300 midwives for Sierra Leone’s seven million citizens. This causes vast challenges for health service delivery. Rural areas face particular constraints with two thirds of health workers currently concentrated in just four urban centres: Freetown, Bo, Kenema and Bombali. Staffing challenges were exacerbated by the Ebola Virus Disease (EVD) outbreak, which exposed weaknesses in the country’s health system and knowledge gaps among its workers. In total, the epidemic caused 296 reported infections among frontline health staff, and 221 reported health worker deaths. The Strategy outlines steps to improve trainings and management of health workers at various levels as well as planning and financing efforts to support implementation of the plan. Since close to half of the health workforce in Sierra Leone is currently made up of unsalaried workers, the Strategy will also guide efforts to absorb these workers into the workforce, and to improve rural retention rates. Deputy Minister Rahman added that significant actions have now been taken to improve the skills and quantity of health workers, with the overall health workforce experiencing more than 20 percent growth across the last five years. As well as improvements in the underlying information system, there have been major investments in the country’s College of Medicine and Allied Health Sciences, the country’s only medical training institution, as well as national midwifery and nursing training programmes. Developed by the Ministry of Health and Sanitation, the Human Resources for Health Strategy 2017-21 is the product of extensive consultation with a range of stakeholders from across the health, education and private sectors. It is based on a Human Resources for Health Profile, which provided a situational analysis to inform the plan, and is accompanied by a refreshed Human Resources for Health Policy covering a five year period.